Tomatillo Salsa is smoky, spicy and sweet. This fresh Tomatillo Salsa is a super easy and quick to make. 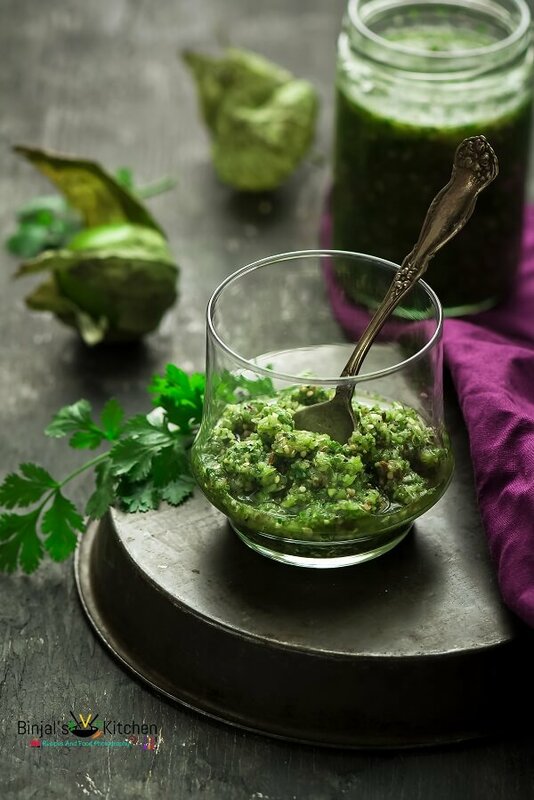 Tomatillo Salsa is a combination of tomatillos, chilies and cilantro creates a salsa with authentic Mexican flavor. Tomatillo Salsa is my favorite salsa, hands down, and that’s coming from someone who loves salsa. You can throw all ingredients together in a blender and your Salsa is ready in a minute. In addition to making the great dip for tortilla chips, this salsa pairs perfectly with fajitas, burritos and quesadillas. 1. Remove the husks from the tomatillos then wash and clean it. 2. In a deep pan add oil and cleaned tomatillos. Roast it for few mins till slightly brown spotted. 3. Let it cool down, then cut it in half and add it into the food processer jar. Add onion, Jalapeno/Serrano peppers, garlic, lemon juice, cilantro and salt. 4. Now blend it till smooth coarse paste. Remove it and store it in a cool place in an airtight jar. 5. Tomatillo Salsa is ready to serve with nacho, tacos. You can also have it with any Mexican recipe. 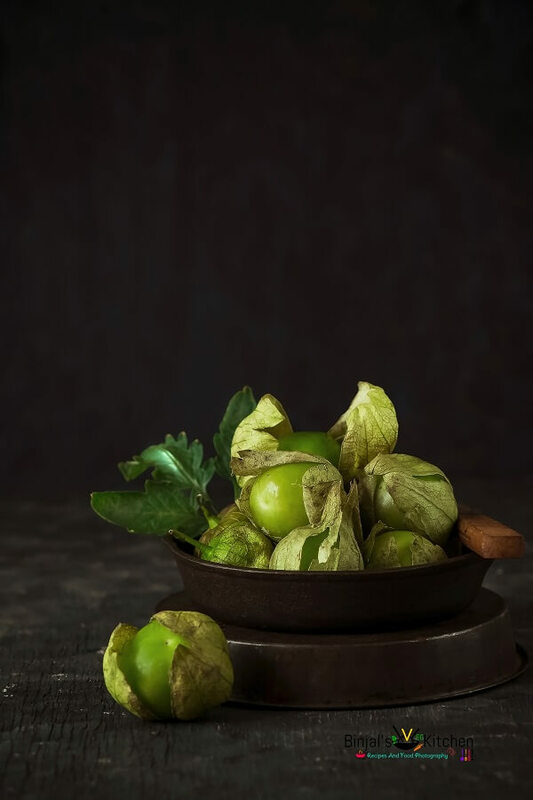 • You can boil or grill tomatillos instead of roasting in oil. • Adding peppers are as per taste (spice level). Tomatillo Salsa is smoky, spicy and sweet. 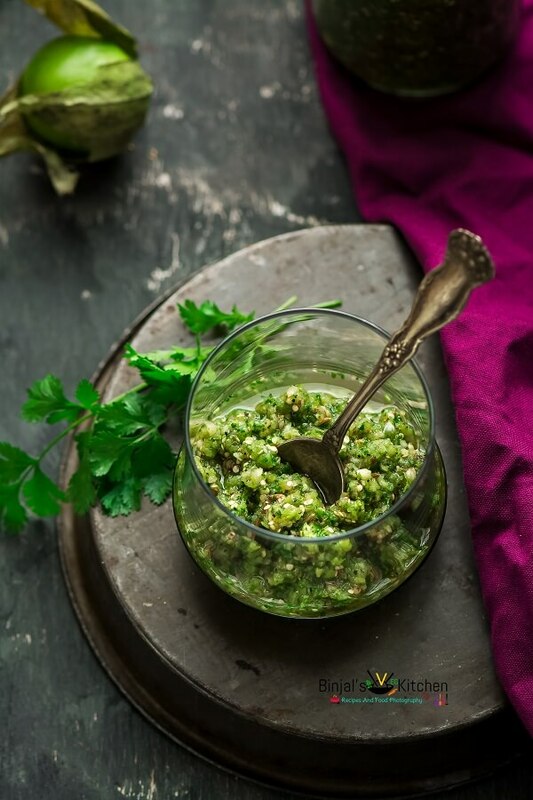 This fresh Tomatillo Salsa is a super easy and quick to make. Tomatillo Salsa is a combination of tomatillos, chilies and cilantro creates a salsa with authentic Mexican flavor. Tomatillo Salsa is my favorite salsa, hands down, and that's coming from someone who loves salsa. You can throw all ingredients together in a blender and your Tomatillo Salsa is ready in a minute. In addition to making the great dip for tortilla chips, this salsa pairs perfectly with fajitas, burritos and quesadillas. Remove the husks from the tomatillos then wash and clean it. In a deep pan add oil and cleaned tomatillos. Roast it for few mins till slightly brown spotted. Let it cool down, then cut it in half and add it into the food processer jar. Add onion, Jalapeno/Serrano peppers, garlic, lemon juice, cilantro and salt. Now blend it till smooth coarse paste. Remove it and store it in a cool place in an airtight jar. Tomatillo Salsa is ready to serve with nacho, tacos. You can also have it with any Mexican recipe.